In May 2008, architectural remains were exposed and cleaned at ‘Ein Hela (Permit No. A-5353; map ref. 19956–75/63614–20), a joint initiative of the Israel Antiquities Authority, and the Jewish National Fund. The excavation was directed by D. Ein Mor on behalf of the Israel Antiquities Authority, with the assistance of P. Betzer (inspection), A. Hajian (surveying and drafting), A. Nagorsky, employees from the Intel Company and volunteer youths from the Kivunim Program. Over two days, two excavation squares (A1, A2; Fig. 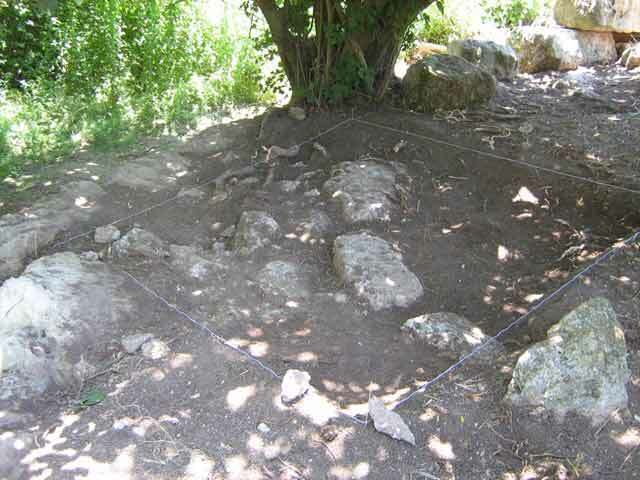 1) were opened in the streambed of Nahal Meir, c. 1.5 km northwest of Moshav Mesillat Ziyyon in the Judean Shephelah. Four walls (W1–W4) were exposed, and the top of another wall was revealed northeast of the excavation squares. The level of the groundwater in the vicinity of the site is high, and there are therefore many wells in the area, among them Bir al-Qasab, Bir Ayyub, Bir Hilo (Hilweh; Conder and Kitchener 1880, Sheet XXI) and ‘Ein el-Diban (‘En Mesilla; see Mandate-period Map of Bab el-Wad, Sheets 13–15, 1:20,000). 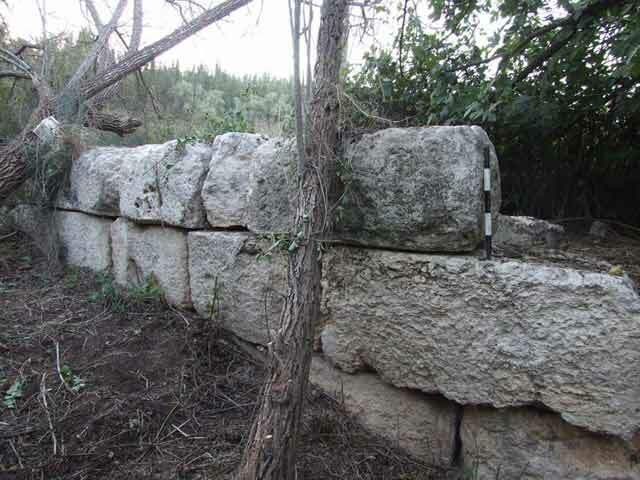 Remains of an aqueduct that used to irrigate the fields were documented near Bir Hilo, c. 1.4 km from ‘Ein Hela (Clermont-Ganneau 1899:495–497). South of ‘Ein Hela were the remains of a water reservoir that had collected runoff water, and indirect evidence of a saqiye well from the Byzantine period (Permit No. A-7069). Wall 1, which was curved, was identified on the surface prior to the excavation (length c. 17 m; Fig. 2). The wall was built of large (average size 0.5 × 0.6 × 1.1 m) and very large ashlars (0.9 × 1.7 m) that were meticulously arranged as stretchers. Only the eastern face was exposed, to a height of three courses (height 1.75 m), while the western face remained covered with alluvium. Remains of light gray plaster were apparent on some of the stones, as were projections and hollows that may have been hewn to aid in transportation or to secure the stones in place. Wall 3 was exposed in the south of Sq A2 (length 3.1 m, width 0.6 m) and formed an acute angle where it met with W1. Only two fieldstones and one ashlar, arranged in a row, were preserved of this wall. Wall 2 (length 4.2 m, width 1.1 m) was discovered at the northern edge of Sq A1, below an accumulation of loose soil (thickness 0.1 m). It may have joined W1. Wall 4 (Fig. 3) was discovered in the center of Sq A1, west of W1, within collapsed stones; it may have been parallel to W1. Several fragments of light brown plaster containing gravel and charcoal inclusions were discovered between the stones. Another wall was exposed on the eastern bank of the streambed, c. 10 m northeast of the northern end of W1; it was constructed parallel to the bank, and continued north for several dozen meters. A few non-diagnostic pottery sherds were discovered in the two squares. The massive construction of W1 and W2 probably indicates that they were part of a public building. The location of the walls in the streambed and the plaster remains on W1 seem to suggest that this building was associated with water utilization, perhaps of groundwater. The many wells and water reservoir that were previously discovered in the area, show that the high groundwater was exploited in ancient times. Conder C.R. and Kitchener H.H. 1880. Survey of Western Palestine, Maps of Western Palestine, in 26 Sheets, from Surveys Conducted for the Committee of the Palestine Exploration Fund (PEF) During the Years 1872–1887. London. 2. Wall 1, looking west. 3. Wall 4, looking southeast.